Friday and Saturday last week saw me at UK GovCamp 2012 (or #ukgc12) – the annual unconference for gov geeks, digital doers and people who just want to make public services and society better. It was, as ever, a mind-bending delight of energy, passion, ideas and camaraderie. The public sector (all of it – central gov, local gov, public services) need contructive disrupters and there seemed to be less of them at camp. Maybe this is because things seem to have started in the right direction with the creation of the Government Digital Service (GDS), maybe it’s because people don’t want to speak out because they don’t feel secure in their jobs, or maybe complacency is seeping in. Whatever the reason constructive disruption is vital and we need to get back to having more of it around. I guess this is related to my first point but at some time on Saturday I started to worry that group think is starting to emerge within the govcamp community. I haven’t thought about this enough but I know that the thought really worries me at the moment. Mike Bracken‘s presentation at the end of Friday was a mixed affair for me – slightly patronising (and I know it wasn’t in any way supposed to be), slightly worrying (from both a user and local gov perspective) and yet very very positive and exciting. I’m glad he came and spoke although I’m not wholly comfortable in the way he did it. We need a local government version of GDS – and I’m sort of excited that one may already be self-organising even if it eventually gets consumed by the centre. I wouldn’t normally encourage going into an unlit room with men you only really know off of the internet but spending most of Saturday in a ‘reflective practice’ session with Dave Briggs, Carl Haggerty and Jeremy Gould (as well as a number of others drifting in and out) was absolutely the best decision I could have made. Having a quiet space to just let thoughts flow does lead to a fair bit of nonsense but also to a lot of revelations. We covered digital history, how GovCamps and the movement have changed over the last five years, what’s next in grassroots digital government and whether a two-day GovCamp works or not. Reflective practice about a general and personal journey as well as some critical thinking about the bigger questions was definitely worthwhile. As if that wasn’t enough the Quaver Twiglet Sandwich Dog was quite something to witness the creation of. GovCamp isn’t so much about digital anymore. It’s bigger than that and while it’s really interesting and important it means it isn’t so relevant to my day-to-day working life (which is about digital). It meant that while I could have happily sat in any of the many, many sessions and learnt something or shared something I didn’t feel as compelled to do so as I have before. Again, putting GDS aside, central gov seems even worse than local gov at thinking about things from a user perspective. I wonder if this is because it’s harder for them to imagine their end user – especially for the policy makers – and localgov is moving faster toward thinking about UX due to being closer to our users in terms of service delivery? We still aren’t thinking about UX enough. I was honoured to co-host a session with Carl Haggerty about our thoughts on content strategy for local government. I think we both learnt a lot and for me, hearning Carl say these things out loud, was brilliant. I speak more so than ever for myself and not on behalf of my organisation, when I say I believe Carl is absolutely right – local gov should stop doing what they’ve always done, stop creating their own everything-in-one-place websites and start concentrating on content standards so wherever the information is delivered online it’s fit for purpose and full of UX win. I am very lucky to have a job which I love, working in a great team in my direct workplace but also with som many peers I’m so pleased I can now call friends. When you get off the Victoria Line at King’s Cross to head for St Pancras don’t follow the signs for St Pancras unless you like a really, really long walk underground only to emerge at the wrong end of the station. Annoying. I’d follow the signs for Euston Road instead. While the great thing about GovCamp is that we’re all there on an equal footing, because we want to be rather than because we’ve been told we should, there are definite tiers emerging – the usual central/local gov line is still there although being crossed in places; GovCamp veterans / n00bs; thinkers / doers. We all absolutely deserve to be there, should be there and should have voices heard if we want to participate but the practicality of organising sessions which don’t play to one side of these relationships more than the other is becoming noticably harder (and that is no reflection on Dave, Steph or any of the session facilitators who all did sterling work). 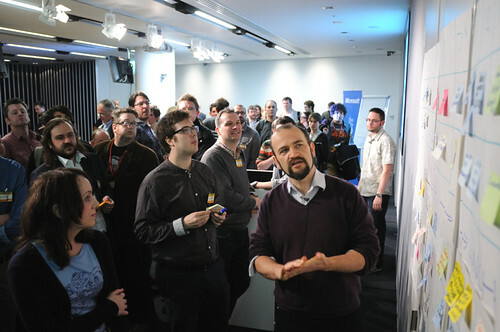 We should have a big localgovcamp again in the summer – I’m happy to help organise this if others think it’s a good idea? My reflection on how GovCamps have changed for me over the last few years is that when I started attending I was hungry for information and practical sessions about how to use social media tools. Now, I hardly think about social media, or tools and it’s about looking at the bigger picture, gaining context for the things I do and having Big Conversations about even Bigger Ideas with people who never fail to astound and also amuse me. This visualisation by Tim Davies (I think) of tags associated with each GovCamp since the first one in 2008 is fun and interesting too. It was great to see light bulb moments happening within sessions, especially within sessions you’re nominally facilitating. My favourite was from Charlotte Stamper about being more savvy about understanding users on our own site and making use of high traffic areas to market other council services – the example was that if we know lots of people are coming to report potholes why don’t we advertise our need for foster carers to those people, within the pothole reporting pages? A brilliant question and this sort of thing is something I’d like to think more about. I didn’t get to speak to everyone I wanted to and didn’t get to have long enough conversations with most of the people that I did. Sorry if I missed you or we were cut short. I think GovCamp would need to be about a week long if I were to achieve conversations with everyone on my list! There were a lot less comms folk there than I’ve seen in previous years. There were about 300 people there over the two days and I think I saw about 10-20 comms people. I’m not sure whether this is good or bad – either it means comms has got out of the way and digital is more open to others within organisations under their guidance or it means they have really stepped up their self-appointed gatekeeper role and aren’t even willing to engage anymore. The ones that were there were amazing and inspiring and credits to their organisation. A slow walk on a quiet morning from Pimlico to Victoria Street via bustling markets and amazing architecture is the sort of thing that makes me soften toward That London. I will try and write up some notes about both of the content strategy sessions I ran with Carl (well, I stood at the front with him) and give some pointers about our practical outcome from the Saturday session. Thanks to Dave Briggs, Steph Gray, Microsoft, Lloyd Davis, the generous sponsors, Hadley Beeman and my very old friend Matt who now works in the Treasury for their respective parts in making GovCamp 2012 amazing (and successful for me) yet again. I’m already looking forward to UKGC13. Posted in Content strategy, Events, GovCamp, localgovcamp, Usability.Tagged content strategy, critical thinking, digital media, GovCamp, Government, local government, Microsoft, reflective practice, research, ukgc12, unconference, weeklyblogclub. I like this post. I especially like the fact that you mention challenging group think. In some ways govcamps mitigate for it by being so open and inclusive, but it’s worth keeping an eye out for and challenging. With Brewcamp we’ve started having one slot out of the three to be a challenge item. So, we’ve had Nicky Getgood come and tell us how hard she has found it to communicate with, which really means “get a response from”, her council. I think that was one of the best sessions we had last year. So, if we do want to avoid self-congratulations and inward-looking stagnation, what can we do? How do we drag people to gov camp who are skeptical? Thanks for the comment Simon. Glad you enjoyed the post and it was good to catch up with you, briefly, on Saturday! Someone made the point to me on Twitter after they read this post that perhaps all the constructive disrupters were actually at work rather than GovCamp. I had to admit that perhaps that is true, and perhaps also of the skeptics that would challenge any group think which (it feels to me at least) may be emerging in this community. I think, as a movement, GovCamp attendees are still pushing toward Making Government Better and I think there is still frustation in some parts as to the lack of power and progress they feel they’ve made. Perhaps it just needs more new faces, perhaps it would feel different at a regional localgovcamp. Perhaps it needs more people from the third and private sector (as well as private individuals) to get involved as critical friends. Is that the next evolution – CitizenCamp? I really hope this is mainly paranoia on my part and we can keep critically engaging and challenging each other and Government more widely. Oh – and I love that you’re deliberately putting a challenge item on the BrewCamp agenda 🙂 Ace! This is such good stuff, Sarah. I’m happy to throw my hat into the ring and help with the next localgovcamp if needed. Not to have one come June would just be utterly unthinkable to people – like me – who really rely on it to recharge batteries and inspiration. There’s so much to nod in agreement at with this. Of course, some of us who sometimes ask questions – even if it’s just to act as devil’s advocate – weren’t there this year. Thanks Dan – I’m really hoping that there is a big localgovcamp again this year too. I agree that it’s good for motivation and inspiration and I would love it if more frontline folk or senior managers also got involved. I do agree with Dave Briggs though that the best people to be at a GovCamp are the people that want to be there – you’re not going to get the level of passion and engagement if people feel they ‘have’ to attend! Thanks for your comment too Janet – and of course that is true. Someone else suggested that constructive disrupters were all at work 😉 A lot of the people there though have been in the disrupter role before and didn’t seem as keen on agitating this time round. Perhaps it’s because things are changing in gov; perhaps we all know each other too well; perhaps it was just conincidence on the day. Whatever the reason as long as disrupters still exist somewhere I’m not too worried!